Sometime last winter a picturesque bigleaf maple framing Wahclella Falls tumbled into Tanner Creek, likely under the stress of heavy snow or ice. 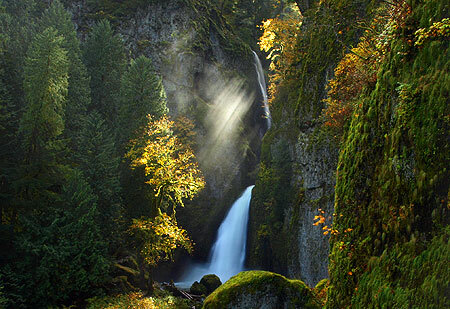 In any other spot, this event might have gone unnoticed, but the Wahclella maple had the distinction of a front row seat at one of the most visited and photographed waterfalls in the Columbia River Gorge. Tanner Creek gorge is no stranger to change. 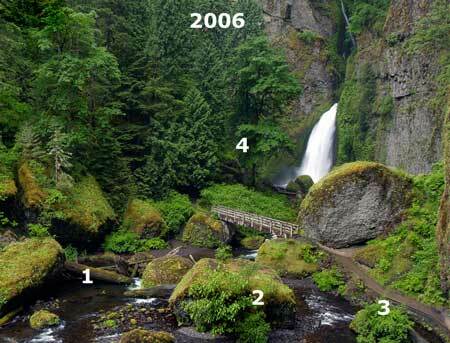 In the spring of 1973, a massive collapse of the west wall, just below Wahclella Falls, sent a huge landslide into the creek, temporarily forming a 30-foot deep lake behind the jumble of house-size boulders. Today, the popular Wahclella Falls trail crosses the landslide, providing a close-up view of the natural forces that have created this magnificent place. The main change to this scene is the Wahclella maple (4), itself. Because the tree fell into a brushy riparian thicket, the fallen trunk and limbs have already been largely overtaken by lush spring growth of the understory. In a few short years, the fallen tree will disappear under a thick layer of moss and ferns, completing the forest cycle. But the story of the fallen Wahclella maple doesn’t end there, thanks to the unique adaptive abilities of bigleaf maple. Unlike most of our large tree species, bigleaf maple is prolific in sprouting new stems from stumps or upturned root balls. The massive, multi-trunked giants that appear in our forests are the result of this form of regeneration. In this way, the Wahclella maple already seems to be making a comeback. With its former trunk still lying nearby, the shattered base of the tree has sprouted several new shoots this spring. In time, there’s a good chance that some of these shoots will grow to form a new, multi-trunked tree, perhaps one that is even more magnificent for future generations of photographers. In the meantime, the old maple tree is a reminder that the beauty of the area is forever a work in progress, and how fortunate we are to watch the each stroke of nature unfold. 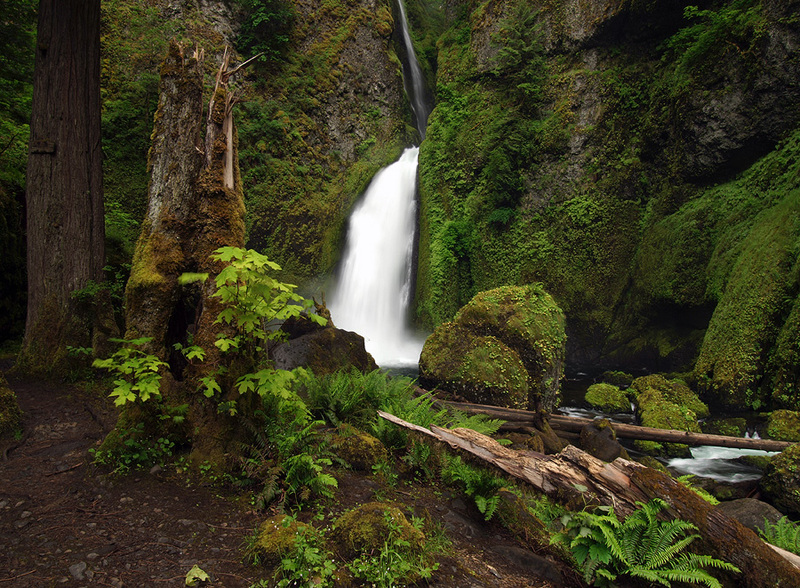 Though hardly a secret anymore , the hike to Wahclella Falls remains a less traveled alternative to other short waterfall hikes in the Gorge. The trail is generally open year-round, though the best times for photography are in May/June, when spring greenery is at its peak, and in late October, when the bigleaf maples light up the forest with bright yellow and orange hues. This is a terrific family trail, thanks to several dramatic footbridges, two waterfalls, a staircase, caves (!) and several streamside spots safe for wading or skipping stones. Young kids should be kept close, however, since there are also some steep drop offs along sections of the trail. For kids, midweek in midsummer is a perfect time to visit. Another fascinating time to visit with kids is during the fall spawning season, when the stream below the hatchery diversion dam is filled with returning salmon and steelhead within easy view of the trail. The trailhead for Wahclella Falls is easy to find. Follow I-84 east from Portland to Bonneville Dam (Exit 40), turning right at the first stop sign then immediately right into the trailhead parking area along Tanner Creek, where a Northwest Forest Pass is required. Portable toilets are provided at the trailhead from spring through early fall. The trail begins at a gate at the south end of the parking area, and initially follows a rustic gavel road to a small diversion dam that provides water for the Bonneville Fish Hatchery. 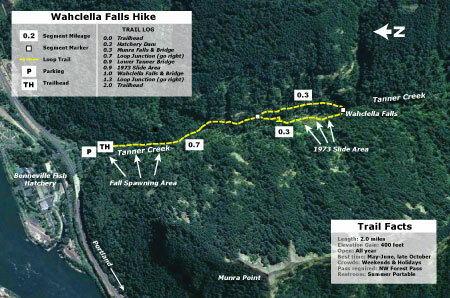 From here, the route crosses a footbridge in front of Munra Falls, and becomes a proper hiking path. 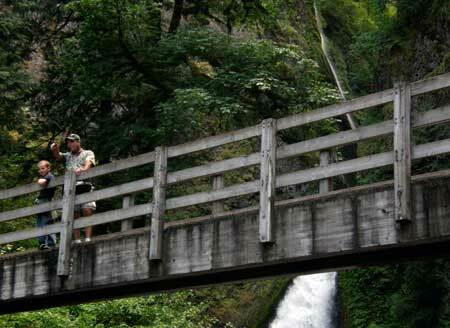 Head right (downhill) at a fork in the trail 0.7 miles from the trailhead to begin the loop through the towering amphitheater surrounding Wahclella Falls, then retrace your steps 0.7 miles to the trailhead after completing the 0.6 mile loop portion of the trail. Enjoy! 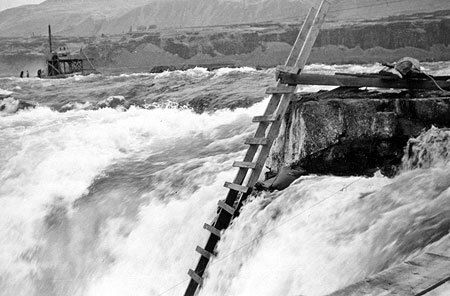 One of the first articles I wrote for the WyEast Blog continues to be among the most popular: Restoring Celilo Falls (February 14, 2009). 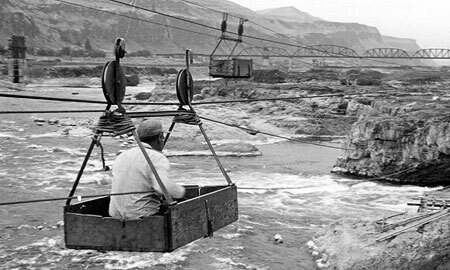 In the spirit of keeping the idea alive, this article is a tribute to the way of life that all but vanished when Celilo Falls disappeared in 1957, as revealed in photographs. You can click here for a large view of the blended image, with the caveat that it retains the same publication terms as any other image in the Oregon State University Commons (use your browser window to pan across the image, as it is much larger than most monitors). 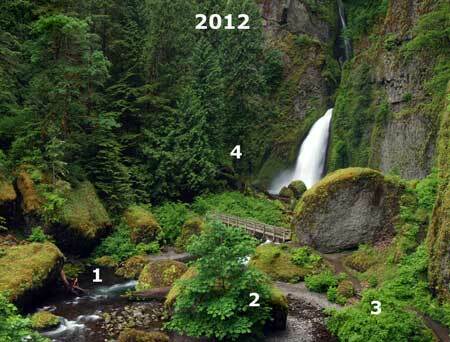 My original intent was simply to have a detailed panorama of the scene at Horseshoe Falls, the most iconic of the dozens of cataracts that made up the massive Celilo Falls complex. But as I stitched the images together, the details within the larger image suddenly came into view, and provided new insights into the unique way of life that had evolved over millennia at Celilo. The above view also shows a returning shuttle car, perhaps empty, or possibly loaded with filled salmon crates. 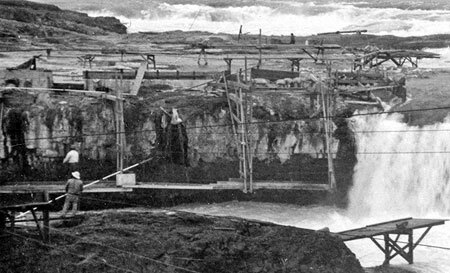 Pulley systems like these moved fishermen and salmon catch on a network of cables that connected the multitude of rocky islands within the falls complex where fishing platforms were located. The following clip (from a separate image) shows the same pair of fishermen seen in the previous clip from the panorama, but from a somewhat different angle. In this view, more details on how their platforms functioned are revealed: a crib of rocks anchors the middle platform, while and all three have large, wooden crates for salmon. The size of the crates is also telling, as the typical salmon weighed 25-40 lbs, with many big Chinooks weighing in at well over 50 lbs. Landing these huge fish clearly required great skill, strength and agility using 15-foot dip net poles on a slippery plank surface. Also visible in the above image are the safety ropes that the men tied to their waists while working the platforms. This was a relatively recent insurance policy in the ancient fishing tradition, and one that was seldom tested by people who had grown up around the platforms, working the salmon harvest. The following image shows the top of the ladder seen on the right side of the panorama, but viewed from just above the platforms. As with the fishing platforms, the ladder is anchored by a wooden, rock-filled crib. The above image also shows fisherman working on the next rock outcrop (in the upper left) seemingly afloat in the river, though clearly on another system of platforms in the larger panorama. 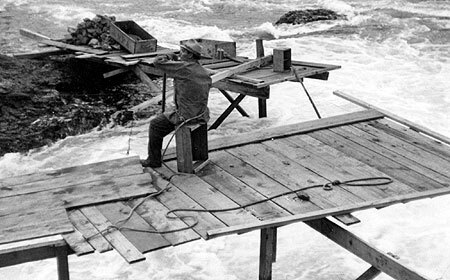 In another photo of the scene (below), the safety ropes can be seen in more detail — one tied to the fisherman — as well as the planked decking that was informally scabbed to platform supports. Though sturdy, the informal construction of the platforms and catwalks makes sense, given that seasonal flooding almost certainly swept away anything that wasn’t removed by the fishermen at the conclusion of the fall fishing season. Yet, the position of individual platforms reflected traditional locations where the same families had fished over the generations. In that sense, while temporary in design, the platforms were also permanent. 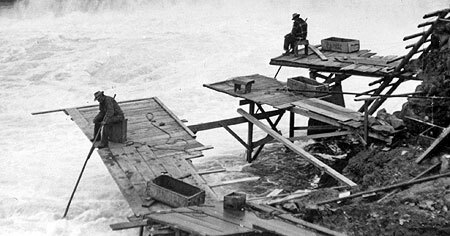 Deconstructing these scenes in creating the panoramic view left me with an even greater appreciation for the fishing tradition at Celilo Falls. It also gave me new inspiration to see the falls restored, not simply for their scenic and spiritual value, but for the working fishery they provided. What a thrill it would be for the dip net fisheries to return to these rocks, and to watch them just as photographer who captured these images did! The attraction of the Celilo restoration idea is that it is completely reachable. The falls is still there, underwater, and serving as a permanent reminder of our priorities as a society. It can be restored. As the salmon runs continue to fade on the Columbia, along with the barge traffic once used to justify the dams, the sole argument against restoring Celilo Falls fades as well: it is as simple as finding better ways to generate — or conserve — the 1,800 megawatts of hydropower that is generated by The Dalles Dam. It’s really that simple. 1930s painting of Indians fishing at Celilo Falls, as they had for thousands of years prior to white settlement of the Oregon Country. In recent years, conservationists have lined up against a proposed Indian Casino in the Columbia Gorge, and with good reason. While the project would certainly benefit the people of the Warm Springs tribe, it would also have unacceptable environmental effects on the Gorge (A better solution is to simply locate the casino in Portland, which is the obvious force driving the Cascade Locks location – separate article to follow). But if you are a like-minded conservationist, you have an alternative for supporting the Native American economy that doesn’t involve slot machines. Simply pack a large cooler on your next visit to the Gorge, and stop by one of several roadside salmon markets, where Indians from the Gorge tribes sell fresh, “over the bank” chinook, coho, steelhead, sockeye, walleye and shad. A surprisingly small number of urbanites who visit the Gorge support these fishermen, possibly because they don’t understand the fishery. But if you have never had fresh salmon, you will be pleasantly surprised at the difference in flavor between the tribal fisheries and the fish-farm salmon that your local supermarket is likely selling as “fresh” (dyed pink to disguise its origin, since fish farms produce a gray meat in salmon). The tribes also sell the finest smoked salmon available, anywhere — after all, they have had thousands of years to perfect the smoking process, and smoked salmon can be eaten plain, as a snack or with hors d’oeuvres, or used in salads, pasta, casseroles or other cooked dishes. Fresh and smoked salmon freezes well, so buying during the fall harvest, in particular, can provide for a full winter of salmon in your diet. This is an excellent option when fish isn’t available at the roadside markets, and helps the tribes sustain their economy over the winter months, as well. The Nez Perce, Umatilla, Warm Springs and Yakama tribes have had permanent rights to harvest salmon from the Columbia River under a series of 1854-55 treaties with the United States Government. While these treaties have been subject to much litigation — and questionable “compensation” agreements allowed for destruction of Celilo Falls in the 1950s — the tribes manage the fisheries today in cooperation with the state governments of Oregon and Washington through the Columbia River Inter-tribal Fisheries Commission. The focus of the Fisheries Commission is on habitat recovery and sustainable fishing practices, and ensuring that this ancient tradition isn’t lost. 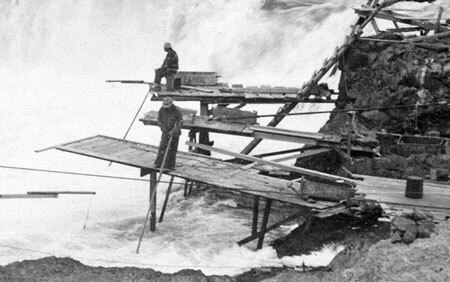 Indians fishing Celilo Falls with dip nets in the early 1900s, prior to construction of dams at Bonneville and The Dalles. On a recent stop at the Cascade Locks market, beneath Bridge of the Gods, a young Indian in his teens asked me “if I knew any stories about Lewis & Clark”. I looked down at my faded t-shirt, commemorating the Lewis & Clark expedition, realizing why he had asked the question. I responded with a few anecdotes from the expedition — how the Indians at Celilo had introduced the explorers to salmon, and in doing so, probably saved their lives. I also mentioned that the early white explorers unknowingly brought diseases with them that erased much of the native population, even before the huge waves of white settlers followed in the 1840s. To his apparent surprise, I also talked about the Corps of Discovery being the first true democracy in the United States, with an Indian woman (Sacajawea) and a black man (York) given equal voice at major turning points in the mission. Upon that, he reached out, shook my hand, and said “thanks, man. I love to hear those stories.” But we both knew he was really testing my knowledge — and my respect for his native culture — to see if I was just another ignorant tourist in a Lewis & Clark t-shirt. I walked away with a bag of smoked salmon fillets and thinking what a complicated world it still is for young Native Americans. You can learn more about the Indian Fishing Harvest at this official website, including the history of Indian fishing in the Columbia, where to find roadside stands, and how to buy fish from roadside vendors. Often, there are several vendors at a site, so if you plan to buy a few packages of fish, make your way from stand to stand, so that you support each of the vendors.